How do Bean Bag Chairs Help Kids with ADD, ADHD, Austism Better Than Other Furniture? How AHH Bean Bag Chairs Help with ADHD and Autism! Can you believe it?!! The Washington Post has featured our bean bag chairs, because they are so great for kids with ADHD and Autism! If your child or another family member is struggling with sensory deficiencies, ADD, ADHD, autism, no matter where they may fall on the spectrum, Ahh! bean bag chairs have been used since 1998 to help! 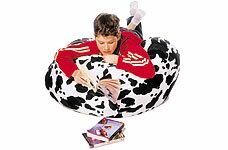 Kids and adults alike find that our bean bags offer the flexibility, portability, and comfort that is lacking in traditional rigid chairs. This allows for less distraction from unresolved antsy-ness; in other words, you can fidget and reposition yourself whenever you need to without so much effort and still are able to find a comfy spot! The best part is you can take this comfy spot almost anywhere you want and create a comfortable and safe place in any space! When Drew Simon gets home after school, he puts away his coat and backpack, carries his lunch bag to the kitchen and grabs a snack before heading upstairs to do homework. It's a pretty standard routine for a 10-year-old. But for Drew, who has been diagnosed with a learning disability, the order and predictability he finds in his Northwest Washington home can be the difference between a productive or a frustrating afternoon. "Everybody thrives when there's structure," said Drew's mother, Ann Simon, who asked that the family's real name not be used. "When things feel random, it's disconcerting, and that's just so much harder for some children." Doctors, teachers and therapists can help with education, medication and parenting advice. These experts in child development agree that simple adjustments in the home -- in both the physical space and the daily routine -- can help all children, and particularly those with learning and attention regulation difficulties. "It can be enormously helpful to these kids if parents and teachers organize their routines and physical environments," said Kurt W. Fischer, director of the Mind, Brain and Education program at Harvard University's Graduate School of Education. "Order does make a difference for them. . . . It's true for all kids." For Drew, this means his belongings aren't just dumped in the front hall; jackets and backpack are assigned designated hooks. The lunch bag has its specific spot on the counter. An estimated 4 million elementary school-age children in this country have learning disabilities that can make school and social interaction more difficult, according to the National Institute of Mental Health. Many children in this group -- an estimated 3 percent to 5 percent of all school-age children -- have attention-deficit hyperactive disorder (ADHD), also called ADD. It is marked by an inability to concentrate, overly impulsive behavior and often, though not always, heightened physical activity. "People will grasp for straws with children with ADHD," said Barbara Wolf, an education professor at Indiana University and former education evaluation researcher at the Smithsonian Institution. "And there are things we can do to help besides just having them pop pills. Parents can also give their children pathways to order in their daily lives." Catherine Trapani, director of education at the Marcus Institute in Atlanta, a nonprofit center that serves people with developmental disabilities, agrees that an ordered home environment can have a positive impact on children with ADHD and other learning differences. "Many of these children are very scattered and disorganized internally," she said. "When order doesn't come from within, it's critical to set them up to succeed, to have their environments simple and structured." "A place for everything and everything in its place," as the adage goes, is a good starting point. In playroom or bedroom, clear plastic bins for toys and clothes, open shelving rather than concealing drawers and a colorful labeling system are commonly recommended. "Seeing something is an important mental cue," according to Judith Kolberg, a professional organizer and co-author with Kathleen Nadeau of "ADD-Friendly Ways to Organize Your Life." As with every parenting challenge, however, there is no one-size-fits-all answer. And, experts say, children with ADHD can vary even more widely than others in their needs, tastes and reactions to physical surroundings. For instance, children often benefit from having large mirrors in their bedrooms and play areas: Seeing their reflections can reinforce an understanding of appropriate expression and gesture, and provide a feeling of socialization. But for some kids, mirrors can be overly distracting, and are best avoided in the homework corner or other places where concentration counts. Similarly, while one child might find it easier to stay on task in a calm, visually uncluttered room, the next thrives in a more colorful, stimulating space. "My daughter is really creative, and she needs a creative environment," said Catherine Adams, of Fairfax, who volunteers for the Northern Virginia chapter of a national support organization called CHADD, for Children with Attention Deficit Disorder. "If I made things plain, it wouldn't work for her. It would be boring." Experts say parents should watch where and how their children work and play most successfully. There they will find the clues to setting up designated areas for activities like homework and reading. Educators and ADHD coaches also suggest that parents involve the child in setting up and organizing space at home. This will slow the process, but that actually can be a blessing. Few children have the attention span for one big spring cleaning, and a whirlwind of stuffing things in closets and drawers probably won't spur longer-term improvements. In fact, a sudden clean-up can be disruptive to a child accustomed to piles of toys or wall-to-wall posters. "Children habituate to their environments," said Wolf. "Parents need to observe their children carefully to see what choices they're making, to see what works for them. Change should come about gradually." For some families, the difficulties the child is reckoning with are also a problem for the parent, a common phenomenon, experts say. If that's the case, professional help might be needed to sort the stuff, purge the excess and develop reasonable expectations for order. Some professional organizers specialize in ADHD, and support groups like CHADD can steer families to personal coaches (800-233-4050, http://www.chadd.org/). "Things don't have to be perfect," said Jodi Sleeper-Triplett, a Herndon-based ADHD coach who has worked with families for seven years. "You just need to figure out what the child needs to feel organized, not what the Container Store says they need." Parents like the Simons say it is important to keep your goals in mind. "Any tools that can extend a child's ability to attend or to focus are good," said Ann Simon. "But it's not the things. It's what's behind them -- the purpose. It's to make the child feel confident and secure."